This thread was initially about creating an updated version of Unofficial SP5. However, for various personal and technical reasons, I was unable to follow my original plans. @Gurgelmeyer, the author of the USP5, used an automatic tool to update the official Service Pack 4 with updates and hotfixes that were released by Microsoft after it. The tool was never shared to the public though, so I began with preparing my own scripts that would do the same work. Yet, I have never gone far enough to be able to integrate the updates into SP4 the same way that he did. Nevertheless, my scripts were still able to merge single updates into so called "update rollups", so I decided to use them to create unofficial packages such as UURollup, Update Rollup 2, HBR Rollup and many others. At that time, I suddenly became responsible for the Updates Lists for HFSLIP for Windows 2000. I had to learn HFSLIP not only from the outside (as a user) but also from the inside (as a maintainer), and also learn how to build and administer a website. In the process I realized that producing more and more small unofficial packages was a dead end. Despite the initial success, they inevitably introduced new bugs and issues that were difficult to track and fix, led to even greater fragmentation of the Windows 2000 update ecosystem and, most importantly, required continuous and active maintenance. In such a situation, I made my mind to fully focus on the Updates Lists with HFSLIP as the ultimate tool for keeping Windows 2000 up-to-date. Everything has been said about HFSLIP (see the HFSLIP forum and my website) so I am not going to elaborate it here. There are at least three reasons why I believe that HFSLIP, despite its limitations, is still better than all other similar tools or prepackaged updates (such as USP5 or unofficial rollups). Firstly, it is a complete program that just works in spite of no active development. It does require small fixes from time to time, but most of them can be done even by a novice developer like myself. Secondly, thanks to its flexibility, HFSLIP is the only such tool able to integrate a large variety of differently structured updates, system files, registry files, addons, any many other packages. Lastly, it supports all language versions of Windows (which is not the case with the majority of the unofficial update packages which are usually English only). All in all, this is how my current point of view stands. The thread itself is old and long, any many things have changed since its creation. Accordingly, many different topics have been discussed here. Since I have discontinued all the other threads related to my work with Windows 2000, feel free to use this one to post your opinion, questions and suggestions on the current and future development of everything related to Windows 2000. The thread's original content is still available in the spoiler below. I have prepared an archive of Windows 2000 related files. All official and unofficial updates, current/old/test versions of Update Rollup 2 and Unofficial Updates Rollup and many other packages are available there. In case of the official updates, they normally can be downloaded directly from Microsoft. 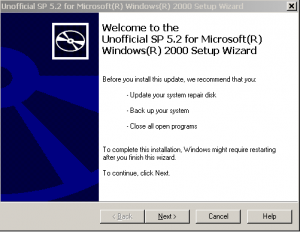 However, recently MS has started to remove some of the older content from their servers, including many Windows 2000 packages. Just in case I have uploaded everything to an alternative location. The official updates can be downloaded in all supported language versions. Hotfixes by request are available there too. Test versions are available in Archive. PLEASE be very careful when installing them. I strongly recommend testing them on a virtual machine first. Everyone probably knows about the USP5 made by Gurgelmeyer at the turn of years 2005 and 2006. He managed to merge hundreds of updates and hotfixes and add them to the existing official SP4, therefore creating USP5. Gurgelmeyer was devoted to the project and kept updating it regularly but he also suffered from health problems and eventually disappeared around summer 2006 (it is unknown what exactly happened to him...). No one was able to take up the project as Gurgelmeyer did not share the tools he was using for merging SFXCAB archives (M$ updates & hotfixes). Around 2008 there was an attempt by Kelsenellenelvian to create a new version of the USP5 but unfortunately it had to be abandoned. No other person tried to anything with the USP after that. Up to now I have managed to create many different packages including unofficial single updates, update rollups and others. The biggest problem with Windows 2000 updates is that there are too many of them. I tried to reduce the number of required files as much as possible but even after merging so many updates there are still many others left. There is a borderline that cannot be crossed without preparing a Service Pack which offers more freedom in including and integrating files than update rollups. This is the reason I decided to try go on with the USP5 and prepare a new updated version of it. It is the only way to merge absolutely everything into one package which could be either installed manually or integrated into Windows 2000 source simply using the "/integrate" switch. As you can see there are quite a few components that need to be integrated but I believe that with help of a few kind people it will be possible to finish the project. The last version of Gurgelmeyer's USP5 was 5.1.2195.24. I want to start from the number 5.2.2195.1. At the moment it is still a long way to go for the final version of the USP5.2 to be ready but the project has been started and there are already people testing early builds of it. I hope that this new version of USP5 will be a tribute to the hard work done by Gurgelmeyer and thanks to it this project will not be forgotten. Until USP5.2 is finished I recommend using UURollup, Update Rollup 2, addons and single updates which are listed on my website. Can all the .net be optional somehow? Are you going to include any kernel extensions in it? If you do, Silverlight 5 works fine as far as I know. I'll take it into consideration I was thinking about .NET 1.0 being optional (=installed only when an older version of .NET 1.0 is present in the system) and the rest being installed by default. Are you talking about the manual installation? I'm going to base the .NET installation on the true addons made by OnePiece so the whole installation process is super fast compared to a "standard" MSI installation. By the way, I've reordered the list a little bit so now it shows a real order in which I want to include all these things. I should mention that I'll also replace the three buggy files with their older version. Is there anyone knowledgeable about about the System File Protection (SFC)? I don't really know that much about it but I've just found a quite interesting thing that XP files, when installed in Windows 2000, are also protected by it! File Signature Verification utility accepts them as long as their catalog files are also installed in the system. Of course this does not apply to the modified files which are not digitally signed. Only files which are "transplanted" as it is can be accepted. I've removed the buggy files (see #6 for details) and also managed to reduce the total number of files in the USP by removing a few duplicates. It would be the best if each file was present in the package only once but it's kind of difficult to achieve "thanks" to the MS hotfix installer which has got many limitations. What I mean by duplicate files is that some files are shared by all editions of W2K (Professional, Server, Advanced Server, Datacenter Server, Embedded) and the same one file was present five times in the USP. I managed to reduce such files to only one. Unfortunately there is only a small number of such files shared by all editions but there are some others shared by only some of them, ex. only by Servers or only by Pro & Server, etc. I'm going to have a look at them and check if there's any possiblity to reduce the number of such files too. 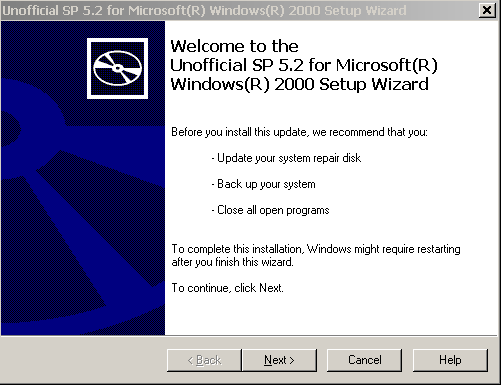 The installer used in USP 5.1 was just too old! I replaced it with a new version which seems to support more functions. It should be possible to get rid of all unnecessary duplicates now. As usually I was a little bit overoptimistic about it Yes, everything I want related to these duplicates can probably be done but it's quite complicated. I'm not sure if spending hours on it just to reduce the size by ~5 MB is worth it. I'm not sure if spending hours on it just to reduce the size by ~5 MB is worth it. I think most of us who use Windows 2000 use them on newer computers with bigger capacity hard drives and in today's world of storage, 5MB just really isn't worth it, but that's just me. If I'm reading correctly, .NET framework 4.0 will be included? Is that something that's already been ported or is that one of your projects specifically related to this service pack? I have a couple of applications that require .NET Framework 4.0 and I can't use them on Windows 2000 because of that limitation. I've already "ported" .NET Framework 4.0 some time ago... but it's available only as a true addon. You can find it here. 1) Unpack the CAB file. 2) Copy the five DLL files to %systemroot%\system32. 2) Unpack "netfx40.in_" to "netfx40.inf"
3) Right click on it and choose "Install". 4) Choose the "NETFX40.cab" as source. I must say that it's not perfect and not all applications will work but you may try to run this tiny tool to see if .NET 4.0 is properly installed or not. You already said in the other topic that you were using UURollup but I forgot to mention that this .NET Framework 4.0 also requires the newest version of it, i.e.UURollup-v8 (ENU). What do you think about .NET Framework 1.1 SP1? Should it be installed by default or only on request? limited software on my computer. I don't need a program that requires 10 other programs to run. The software I use doesn't even require me to have any version of NET Framework.